Pick the Right One: Pears! - Adelaide Central Market: The City of Adelaide's premier food destination. Over 70 traders under one roof. Pick the Right One: Pears! A fruit bowl staple, the versatile pear can be used in a range of different ways, across a range of dishes. In season now, our Market is buzzing with pear magic and many of our fruit and vegetable traders are stocking this all purpose fruit. 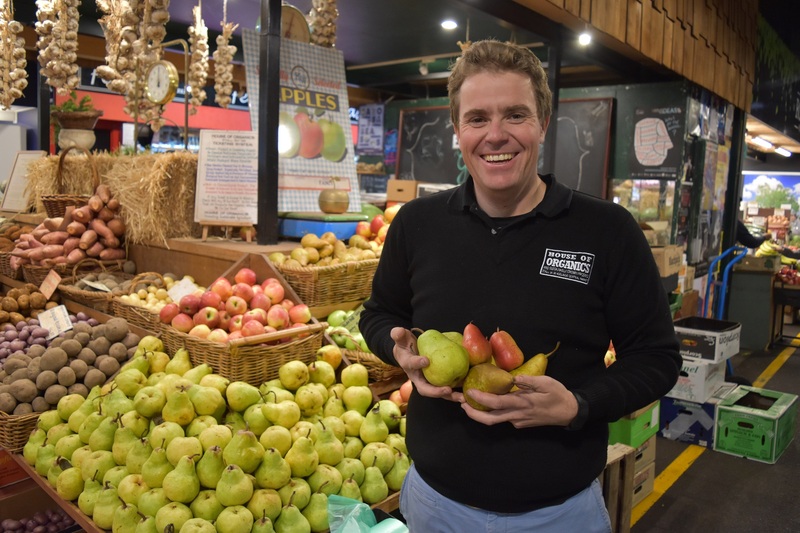 We spoke to Bill Howison from House of Organics (Stall 34/35/36) to find out about his favourite pear varieties and top tips to enjoy their unique texture and flavour. This pear has firm, sweet, juicy flesh. This is the classic, old school, pear that you can find Australia wide and are best enjoyed fresh. Bill’s Tip: Use this as a school lunchbox staple. My kids love how easy they are to eat! Also known as Williams’ Bon Chretien or Bartlett, this medium-sized golden pear can be eaten fresh, added to salads, baked or used to make jam. Bill’s Tip: The Bartlett pear is the best pear to use to make pear jam. You can adjust the flavour of the pear with fresh cinnamon sticks or vanilla bean. The Beurre Bosc is a medium to large pear, with a light brown, smooth but solid skin. They can maintain their shape through most cooking processes, making them one of the best all-rounder pears to use for cooking. Bill’s Tip: Simply poach the Beurre Bosc pear whole and serve with vanilla custard and butterscotch ice cream for a simple, but decadent dessert. This attractive pear has a white, fine-textured flesh and red skin. Add this pear to a fresh salad for a beautiful colour and crunch or on with your favourite cheese platter, paired with a sharp cheddar. Bill’s Tip: Create a gourmet sourdough sandwhich filled with ham, cheddar and sliced red Anjou pear. Delicious! The Corella pear has green skin with a red blush and white, juicy flesh. It’s small in size and is perfect for eating fresh or in salads. Bill’s Tip: This is something my wife does… The Corella pear makes a great table decoration. She places several of them in a bowl and uses them as an edible centrepiece. Try this: Make use of your extra pears and create our beautiful winter dessert, caramelised pear and ginger crumble. You can find the recipe here.